Did you know that the stories you hear from us on NPR and our podcast are excerpts of interviews pulled from the StoryCorps Archive? Participants visit one of our recording locations with a friend or family member to record a 40-minute interview with the help of a trained StoryCorps facilitator, or record a conversation using the StoryCorps App. We’re sharing this unedited interview from the StoryCorps Archive with you in its original form. Regardless of which teams make the NCAA men’s basketball Final Four in San Antonio next weekend, this year’s tournament will be remembered for the emergence of a singular star — one who last played the game competitively more than 80 years ago at a time when by rule only forwards were allowed to shoot the ball. That star is Jean Dolores Schmidt, better known as Sister Jean, the Loyola-Chicago Ramblers’ 98-year-old men’s basketball team chaplain. Since the start of the tournament, Sister Jean has become a media sensation. Whether unabashedly correcting a reporter who mistakenly referred to her newfound fame as “national” and not “international”, or discussing how the 11th-seed Ramblers latest upset victory which propelled them into the Elite Eight had busted her bracket, Sister Jean has been sought-after by reporters from around the world. But before she catapulted to stardom, in November 2015, Sister Jean sat down for a StoryCorps conversation with former Ramblers basketball player London Dokubo. Covering in-depth many of the major events in her life, Sister Jean talks about her love of growing up in San Francisco in the 1920s and shares fun family stories about how her parents exchanged her pet dog for a pet monkey who also happened to enjoy morning breakfasts of toast dunked in hot coffee. That monkey, Jerry, was eventually replaced by an alligator. Sister Jean also discusses her journey to becoming a nun and remembers praying to God when she was 8 for guidance about what to do with her life and telling God that being a nun is what she wanted for herself. After taking vows of poverty, chastity, and obedience and discussing the different stops she made in her career and how she and the people around her were affected by major world events, Sister Jean explained how her love of basketball came about when she was 25 years old and teaching at a school in California. While there, she asked the pastor if the kids could participate in sports and he agreed making her coach for basketball, volleyball, softball, ping pong, and yoyo, and launching a love of sports and coaching that continues to this day. 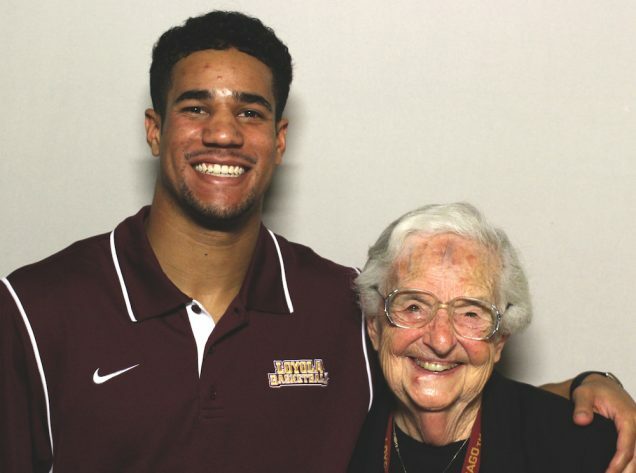 Sister Jean describes how her involvement with the Loyola men’s team began in earnest in 1994 after her retirement from teaching, when the school’s president asked if she would be interested in helping out male and female athletes having a difficult time adjusting to life on campus. Since everyone was doing fine, Sister Jean was then asked if she wanted to become chaplain to the men’s basketball team — a position she remains in today, showing up to all home games in her school colors and custom “Sister Jean” Nike sneakers. While she once sat courtside, she now watches games from higher up, after suffering black eyes and a broken arm in recent years after being hit by volleyballs and a soccer ball. For the first time since they won the title in 1963 — a game Sister Jean remembers watching on an 11-inch black-and-white TV — the Ramblers are just three wins from another championship and the chance for us all to follow Sister Jean as she is paraded through the streets of Chicago. All material within the StoryCorps collection is copyrighted by StoryCorps. StoryCorps encourages use of material on this site by educators and students without prior permission, provided appropriate credit is given. This interview has not been fact-checked, and may contain sensitive personal information about living persons.